The place for students learning Spanish. Learn the basic vocabulary to conduct your first conversation in Spanish. Learn the Spanish names for different members of your family. Learn the basic names for colors in Spanish. Learn to count in Spanish from 0 to 100 and more. Learn the rules and uses of adjectives in Spanish and listen to sample sentences. The Spanish language has both masculine and feminine nouns. Learn the rules and exceptions. Learn about the key interrogative words. Learn Spanish pronouns including: singular, plural, direct object, possesive, indefinite and demonstrative. Our Spanish app is divided into four primary sections: Tenses and Moods, Grammar Topics, Verbs and Vocabulary. Navigate between them quickly and easily to focus in on the information that you are currently looking for. Each section is full of useful information to help you succeed in your class. 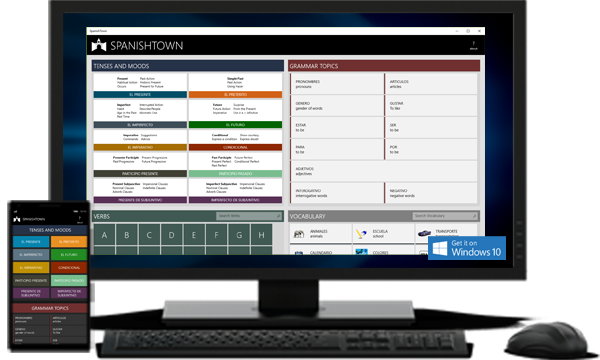 Get your start with our free present tense app for Windows 10. Hundreds of verbs and quiz questions to test your learning. We are currently updating our look to make our website more enjoyable. You may still find older pages that have not yet been updated so please be patient. SpanishTown.ca is full of free Spanish language learning materials for all levels and all ages. Children learning Spanish will love our free vocabulary lists. Download them in PDF format for later reference. Listen to the pronunciation of words and phrases. 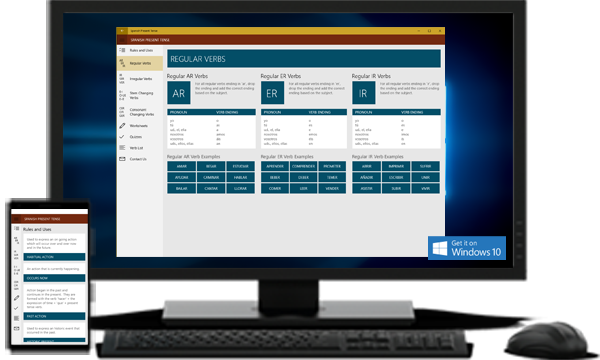 Virtually all of our introductory vocabulary has audio files that will let you listen to a native Spanish speaker pronounce the words and phrases in Spanish. Have fun with crossword puzzles, word searches or matching activities. Check back often as we are always adding new ones to the growing list. Teachers can download and use any of our free Spanish language material in their classrooms.